We would need you, the visitor, the user or the client (hereinafter referred as "You," "Your," or "Yourself") to read this agreement carefully and accept it in its entirety before proceeding with usage of the website, www.rideally.com (here in after referred as “Website” or “Platform”), and/or Android app on Google Play Store and /or iOS app on Apple Appstore, (here in after referred as “MobileApp” or “Platform”) which are owned and operated by RideAlly Travels Pvt. Ltd. (hereinafter referred as “Company” or “We” or “Our” or “us”) with our principal address at 417, 2nd Floor, 27th Main, Sector -1, HSR Layout, Bangalore – 560102, India. 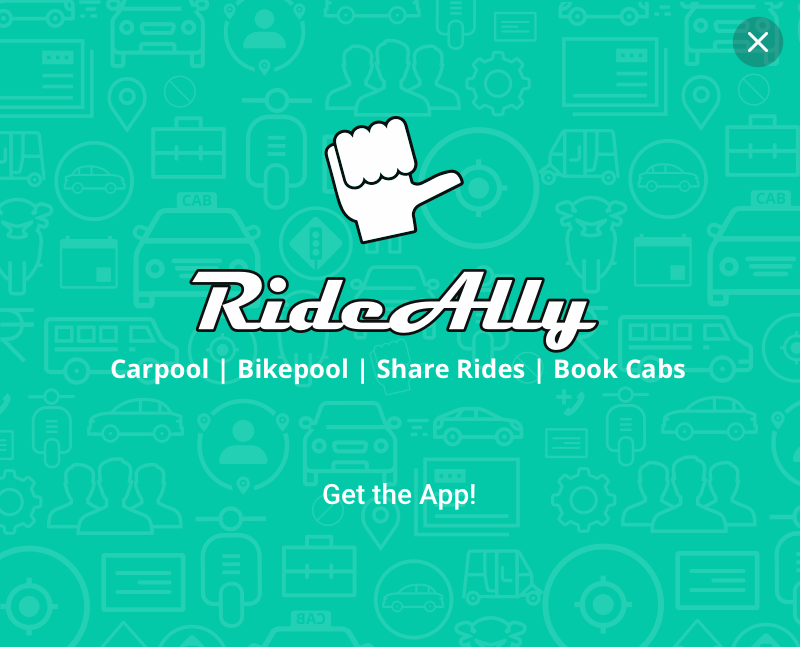 a. Ride-sharing (carpool, bikepool on personal vehicles) Android/iOS App for Corporates (Custom-made), Residential Societies, Events and all trusted members on our platform. Users can share rides on personal vehicles within secure/safe groups legally. The platform provides matches to users who wish to share rides with others. The platform provides users to choose where they wish to share rides, whether in a closed group or with everyone on the platform. It has various closed groups of workplaces, residential societies, pre-defined routes, colleges, schools, events or any other community which wishes to travel with only trusted persons. User can be part of multiple groups, like, workplace, apartments community, college community, events or other trusted groups as he/she wishes to and can also share rides with everyone on the platform. The workplace features provides exclusive access to employees of corporates or workplaces in which employees can get rides, offer their personal vehicle and share rides among themselves in safe and secure manner. Only authorized persons can access the rides in a secured workplace. Company and the Corporate does not own or operate cars or any vehicle and merely works as a platform to connect users travelling in same direction. 'Residential Societies' groups are like Whatsapp kind of groups where the group can have multiple administrators and neighbours are verified by such administrators to keep it a closed group of only verified members. Events are those kind of groups where only participants/delegates of a particular event (conference, marriage, fairs, etc) can share rides. Trusted Users can also choose to share their rides with anyone from anywhere to anywhere. User can book cabs for Airport (from/to), Outstation (Mysore, Coorg, Ooty, Tirupati, Shravanabelagola etc), point to point rides and Local travels (packages of 4/6/8/12 hrs) using the platform. User may call us any time at 080 4600 4600 or write to bookings@rideally.com or book using our Android/iOS app. We are enabling small/medium scale cab vendors with Software so that they can grow in their locality. 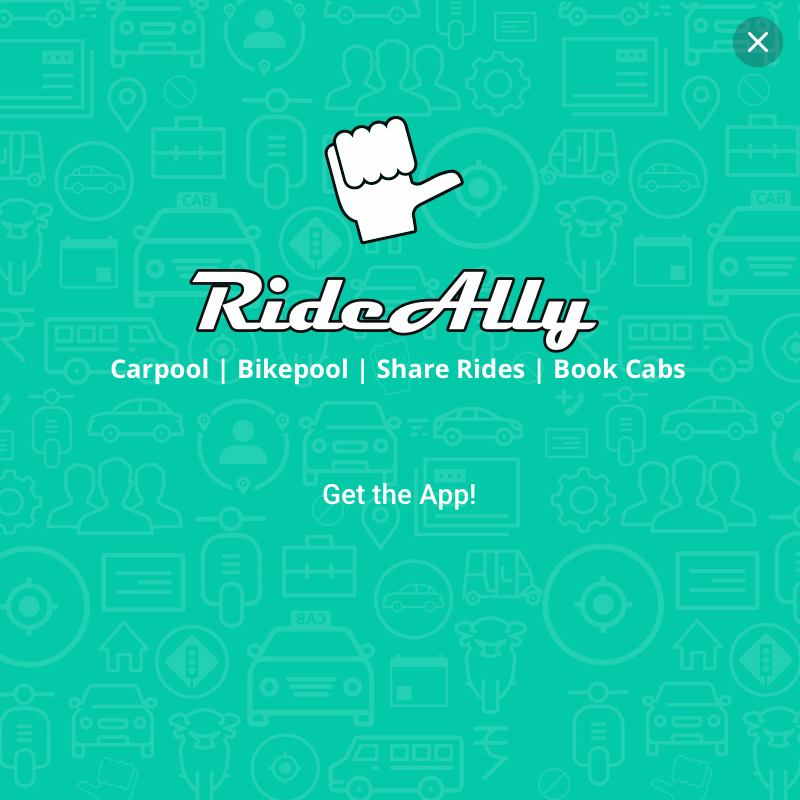 Do check the features at https://rideally.com/cms and request for demo. By registering on platform and accepting these terms, you represent and warrant that you are competent and eligible to enter into legally binding agreement. The minimum age for creating accounts at platform is 13 years (under the guidance of parents or guardians) however only 18 years & above can offer their vehicle. We do allow login facility using Facebook and we understand that you follow Facebook terms which allows to create accounts only if you are 13 years or older. "Account" means registered Member’s account on the platform with a Member ID and password with personal details. "Client" means any person or entity that uses platform by payment to Company or otherwise and any other party traveling with Client who would benefit from the services. "Payment" means the amount of money paid to Company in exchange for services. "Provider" means Company's licensees, suppliers, vendors, information providers, and travel and leisure service providers. "Services" means the platform provided by Company which enables users to share taxi, share rides, create rides etc. “User” means any person who has created an account OR connected through Social Media, like, Facebook, Google etc on the platform and uses its services. "Rider" means that members taking rides in a vehicle. Also, used "Co-Riders" and "Ride Taker" interchangeably. "Driver" means person who has offered the vehicle and is driving at the time of sharing with other riders. He/she may be vehicle owner as well however not always true. “Taxi” or “Cab” means the vehicle that was booked on payment basis using the platform. “Cost” or "Price" means the travel cost for the cab services. You are required to sign up for an account, using your email address, mobile number and select a password to use the platform. You promise to provide us with accurate, complete, and updated registration information about yourself. You may not select as your user-id a name that you don’t have the right to use, or another person’s name with the intent to impersonate that person. You may not transfer your account to anyone else without our prior written permission. You will not share your account or password with anyone, and you must protect the security of your account and your password. You’re responsible for any activity associated with your account. To the extent permitted by law, company reserves the right to refuse or deny access to its services at any time and within its sole discretion. Content, Marks and the platform is provided to you "AS IS" for your information and authorized use only and you agree not to use, copy, reproduce, alter, modify, perform, reproduce, create derivative works from, broadcast, transfer, sub-license, assign, license, distribute, transmit, display, sell, convey otherwise exploit for any other purposes whatsoever without the prior written consent of Company and or/respective licensors. Company grants you a non-exclusive, nontransferable, revocable, limited license to access and use the platform and Content in accordance with the Terms and Conditions. You may not disassemble, decompile or otherwise reverse engineer all or any portion of platform, Content or Marks. You acknowledge that the platform, including the Content and Marks, is subject to applicable export control laws and regulations of the India. You agree not to export or re-export the platform, Content or Marks, directly or indirectly, to any countries that are subject to export restrictions. The limited license provided herein does not confer any right, title or interest in or to the Marks. You shall do nothing, nor authorize nor allow any of your representatives, employees, agents or affiliates, to do anything that is reasonably likely to impair, dilute or bring disrepute to Company or the Marks or to any goodwill associated with Company or the Marks. No right, title or interest in any portion of the platform or Content is transferred to you, whether as a result of use of the platform or such Content or otherwise. Any unauthorized use terminates the permission or license granted by Company. Company reserves all rights not expressly granted in and to the platform, Content and the Marks. Except as stated in the Terms and Conditions, no other use of Content, Software, platform or Marks is authorized without the express prior written consent of Company. We may continuously change or improve platform to provide you best possible experience and your continuous use of platform means that you agree and accept the terms associated with them. We have exclusive right to modify, change or stop the services permanently or temporarily to you or to users generally. You accept that Company reserves the right to disable your account or any feature if it finds any misuse or abuse of services without giving you notice or reasons. You agree that Company may suspend or terminate your account if it finds or suspect that you have not provided the current, complete, accurate information. You also agree to keep the information in your account up-to-date at any point of time and if you fail to do so, than, Company may suspend or terminate your services with immediate effect without citing any reasons. You acknowledge and agree that Company may anytime have right to terminate or restrict your use of service if it hinders Company to provide its services to other customers or to carry its operations or due to non-payment of dues. By using the platform, you agree that Company will not compensate for any losses you make for any reasons due to platform and we would suggest you to use your discretion before use. We will publish guidelines time to time to have safe, secure and comfortable rides while sharing with others and humbly request you to follow them. You specifically agree not to access (or attempt to access) any of the services through any automated means (including through the use of scripts or web crawlers). You agree that you will not engage in any activity that interferes with or disrupts the service (or the servers and networks which are connected to the service). You will comply with all applicable law from your home nation, the country, state and/or city in which you are present while using the Application or service. Company reserves the right to immediately terminate the service and the use of the Application if it is found that you have not complied with any of the rules mentioned in this document. Infringement of any copyright, trademark or patents owned by or licensed to Company. Harvesting or otherwise collecting information about users, including email addresses, without their consent. Intentionally or unintentionally violating any applicable local, state, national or international law, third party rights or Company's policies. Company reserves the right to investigate complaints or reported violations of the Terms and Conditions and to take any action Company deems appropriate including, but not limited to, reporting any suspected unlawful activity to law enforcement officials, regulators, or other third parties and disclosing any information necessary to such persons or entities relating to user profiles, e-mail addresses, usage history, posted materials, IP addresses and traffic information. Company reserves the right to seek all remedies available to it, whether at law or in equity, for violations of the Terms and Conditions, including but not limited to, civil, criminal and injunctive redress and the right to block access from a particular Internet address to the platform and its features. Because of the global nature of the Internet, as a condition of your use of the platform, you agree to comply with all local rules with respect to your account and your online conduct, including all laws, rules, codes, and regulations of the country in which you reside and the country from which you access the platform, including without limitation, all laws, rules, codes, regulations, decrees, acts, orders, directives, legislation, bills, and statutes pertaining to tax, contracts, intellectual property, securities, e-commerce, banking, technology, computers, fraud, and privacy. In addition, you agree to comply with all applicable laws, rules, codes, and regulations regarding the transmission of technical data exported from the India. Company may need to share user’s information with employees and agents, to the Government or law enforcement agencies (if officially requested or required by order, Notification, Statute of the Court) and with anyone else, with the consent of the customer. The vehicle owner has certain responsibilities before registering their vehicles with Company for either cab services or sharing rides. Many times, vehicle owner and driver are the same however it might not be the case always hence we are listing obligations of vehicle owner’s below and please check for driver’s obligations in section 13. The vehicle owner agrees and undertakes to take out and maintain a comprehensive insurance policy to cover third party liability, the occupants of the Vehicle and the Trip offered or booked through the Platform. The vehicle owner agrees that they will, on request, provide the riders with evidence, in advance of the Trip, of the complete validity of its insurance policy. The vehicle owner self-declares that he/she complies fully with all legal requirements of owning and driving the vehicle in use with fully compliant legal documents that include, but are not limited to, a valid driving license, appropriate and valid insurance policy, appropriate registration and tax paid certificates for the vehicle, and a valid pollution-under-control (PUC) certificate. The vehicle owner also undertakes to hold a valid driving license and that the vehicle owner will own or will be entitled to use the Vehicle. The rider or cab user is entitled to request evidence of the Vehicle’s insurance policy, registration certificate, driving licence and PUC certificate at any time up to completion of the Trip. The vehicle owner (or driver) must confirm that their insurance policy allows them to carry riders and that their insurance policy covers all co-riders in case of any accident or incident, which may occur during a Trip. The Rider (or ride taker or co-rider) do have certain responsibilities and obligations to fulfill, which are mentioned in User’s Guidelines at our website. They will comply with the Good Conduct Charter at all times as mentioned in User’s Guidelines. Drivers (many a times vehicle owners as well) who directly or indirectly uses our platform hereby consent and agree that you have read and fully understand and accept the Driver's representations and warranties mentioned below and also adhere to the User’s Guidelines provided at the website. Driver should have a valid driving license and is authorized to operate a motor vehicle and has all appropriate licenses, approvals and authority to provide transportation to third parties in all jurisdictions in which driver uses the service. Driver has the legal right to operate the vehicle, driver uses when accepting riders, and such vehicle is in good operating condition and meets the industry safety standards and all applicable statutory and state department of motor vehicle requirements for a vehicle of its kind. Driver has a valid policy of liability insurance (in coverage amounts consistent with all applicable legal requirements) for the operation of such driver's vehicle to cover any anticipated losses related to such Driver's provision of rides to riders. In the event of a motor vehicle accident, driver will be solely responsible for compliance with any applicable statutory or department of motor vehicles requirements, and for all necessary contacts with such driver's insurance carrier. Drivers, who are offering personal vehicles or white board vehicles, will not make any misrepresentation regarding company, the platform, the services or such Driver's status as a Driver, offer or provide transportation service for profit, as a public carrier or taxi service, charge for rides or otherwise seek non-voluntary compensation from riders, or engage in any other activity in a manner that is inconsistent with such driver's obligations under this Agreement. Driver, who are offering personal vehicles or white board vehicles, will immediately inform all riders of any change whatsoever to the Trip. If one or more riders have made a booking and the driver decides to change any aspect of the trip, the driver undertakes to contact all riders who have made a booking in relation to that trip and to obtain the agreement of all riders to the change. Driver shall not deviate from the agreed route, unless under exceptional circumstances when the agreed route becomes untenable. In case of any deviation due to exceptional circumstances the driver must keep the riders informed of any such change before the deviation, and at the earliest possible time. Driver will only accept riders that has been reported to and validated by their identity. Driver is medically fit to drive in accordance with applicable law. Users can travel in private groups, like, workplace, apartments etc which has only authorized persons in it. In these groups, one can add users by invitation only so that any unauthorised entry can be disallowed. For our cab services, we partner with trusted cab vendors/drivers and verify credentials of vehicle owners, drivers and vehicles. We interview each driver before they attach to us and collect all papers. In addition to above, we humbly request each and every riders or vehicle owners to follow the User’s Guidelines mentioned at our website. The customer shall pay the taxi fare, parking charges, additional night surcharge (where applicable) and any fee or levy presently payable or hereinafter imposed by the law or required to be paid for availing of the Taxi services. The company shall not be responsible or liable for any loss or damage, howsoever caused or suffered by the Customer arising out of the use of taxi service offered by company or due to the failure of company to provide services to the Customer for any reason whatsoever including but not limited to the customer's non-compliance with the services' recorded voice instructions, malfunction, partial or total failure of any network terminal, data processing system, computer tele-transmission or telecommunications system or other circumstances whether or not beyond the control of company or any person or any organization involved in the above mentioned systems. If any passenger if misses the train or flight or bus, company will not be liable for any compensation. The customer shall make an alternate arrangement if the taxi has not reached due to any reason. Smoking or consuming alcohol inside the Taxi. The driver has the right to refuse the pick-up or ask the customer to alight the cab if the customer is found to have alcohol or is found misbehaving with co-passengers or the driver, or is causing a nuisance. Asking the driver to break any Traffic/RTO/City Police and/or government rules for any purpose (especially reaching the destination earlier). The driver has the right to refuse such a request by the customer. The driver also has the right to refuse such a pick-up or ask such customer(s) to alight from the cab if customer forces for it. Asking the driver to board more passengers than the maximum capacity of the taxi. The rules under which the taxi services are provided by the company, stipulate that a maximum of 4 adult passengers shall be allowed per trip for Sedan vehicles. In view of this, the customer shall not pressurize the driver to allow more than 4 adult passengers in the taxi. The driver has the right to refuse such a pick-up or ask such customer(s) to alight from the cab. Pressurizing the driver to overload the boot space of the taxi with luggage. The customer shall not be allowed to use the seating area of the taxi for placing any kind of luggage. The User shall indemnify company from and against and in respect of any or all liabilities, losses, charges and expenses (including legal fees and costs on a full indemnity basis) claims, demands, actions and proceedings which company may incur or sustain directly or indirectly from or by any reason of or in relation to the use or proposed use of the services by the customer and shall pay such sums on demand on the company. Company is hereby authorized to use the location based information provided by any of the telecommunication companies when the user uses the mobile phone to make a taxi booking. The location based information will be used only to facilitate and improve the process of taxi booking for the User. Company is authorized at any time without giving any reason to terminate the booking of taxis done by the users. Company encourages all its customers to take full responsibility of his/her items. We are not responsible if you forgot or missed or lost your belongings during the travel and also not responsible if any damage occurs to the same. If the user leaves any goods in the taxi or has any complaint in respect of the services or the use of the taxi, then same has to inform to company in writing or e-mail within 24 hours of using the taxi or the services of company. The Company shall not be liable for any conduct of the drivers of the taxis. However, the company encourages you to notify it of any complaints that you may have against the driver of any taxi that you may have hired using our services. The Company reserves the right to add to, vary or amend any or all these terms and conditions at any time and the Users shall be bound by such addition, variation or amendment once such addition, variation or amendment are incorporated into these terms and conditions at our site at www.rideally.com on the date that we may indicate that such addition, variation or amendment is to come into effect. All the calls made to our call centre can be recorded by the company for quality and training purposes. It is not legal to earn or share cost from personal vehicles as per Motor Vehicle Act 1988, section 66(1) about 'Necessity of Permits' and section 76 about 'Application for private service vehicle permit' with Definitions mentioned in Section 2 such as (7) of contract carriage, (25) of motorcab, (33) of private service vehicle. We do share our travel with colleagues, friends, relatives etc all the time and RideAlly is just a software platform to enable that. Considering the act and benefits of carpooling and ride-sharing, we have customized our solution to ensure that vehicle owner do not even share cost however they can earn carbon foot-prints, know how many Kms have been shared and may receive rewards/recognition from society, company and NGO etc based on that. The use of the platform (or application) is free of charge however company may charge subscription fee for users who offer/get/share rides using the platform. Vehicle owners shall not use the services to offer or accept for hire or reward or for profit or in any commercial or professional context. Members are reminded that using the services and offering rides for hire or reward or in a commercial or professional capacity may invalidate a vehicle’s insurance and invite adverse legal actions by the road transport authorities. Company shall not be in for any loss or damage incurred by a Member as a result of any breach by a Member of these Conditions. If Company would come to know of any such practices than it would term it as ‘Unauthorised use’ of services and would take appropriate action by banning the account forever. RideAlly provides taxis services through its verified vendors/drivers. The cost for the taxi ride to Airport or any particular place can be found on the platform. These costs are tentative and company reserves the right to modify or update from time to time. It is your own responsibility to remain informed about the current rates for any taxi ride while company will also make an effort to inform you. Payment can be paid using Third Party Provider by online “Payment Gateway” or by cash to the driver after the completion of transportation services provided by the company. You are responsible for the timely payment of all fees in cash to the driver or online. Company has right to charge and shall change fees from time to time for waiting charges, night charges, peak-time charges, toll charges etc. Charges will be with applicable taxes where required by law. You agree that you will pay all charges which are applicable during the transport service. Charges paid by you are final and non-refundable, unless otherwise determined by company. As between you and company, company reserves the right to establish, remove and/or revise charges for any or all services obtained through the use of the platform at any time in company's sole discretion. Further, you acknowledge and agree that charges keeps on changing substantially during times of high demand in certain areas. Company will use reasonable efforts to inform you about such charges which may apply, provided that you will be responsible for all charges incurred regardless of your awareness of such charges or the amounts thereof. Company may from time to time provide certain users with promotional offers and discounts that may result in different amounts charged for the same or similar services obtained through the use of the platform, and you agree that such promotional offers and discounts, unless also made available to you, shall have no bearing on your use of the platform or the charges applied to you. You may elect to cancel your request for services from a Third Party Provider at any time prior to such Third Party Provider's arrival, in which case you may be charged a cancellation fee. You shall be responsible for the cost of repair for damage to, or necessary cleaning of, Third Party Provider vehicles and property resulting from use of the Platform in excess of normal “wear and tear” damages and necessary repair or cleaning. In the event that a Third Party Provider reports the need for Repair or Cleaning, and such Repair or Cleaning request is verified by Company in Company's reasonable discretion, Company reserves the right to facilitate payment for the reasonable cost of such Repair or Cleaning on behalf of the Third Party Provider. Such amounts will be transferred by Company to the applicable Third Party Provider and are non-refundable. The content on the platform, including without limitation, text, software, scripts, graphics, images, button icons, clips, digital downloads, data compilations, sounds, videos, articles, and the like ("Content"); Company 's trademarks, service marks, service names, and logos contained therein ("Marks"); and all the software used on this Platform, are owned by or licensed to Company and are subject to copyright, trademarks, design, patents and other intellectual property rights under Indian and foreign laws and international conventions. If you believe in good faith that materials hosted by us infringe your copyright, please provide the written information requested below. The procedure outlined below is exclusively for notifying Company that your copyrighted material has been infringed. A clear identification of the material you claim is infringing the copyrighted work, and information that will allow us to peruse that material, such as a link to the infringing material. Include the following statement: "I have a good faith belief that the use of material that is apprehended to infringe my copyright is not authorized by the copyright owner, his agent, or the law." Email or post the notice to contact information mentioned at 'Contact Us' section of home page of Website. We suggest that you consult your legal advisor before filing a notice or counter-notice. Also, please note that you may be liable for damages (including costs and attorney's fees) if you make a false claim of copyright infringement. We will review and address all notices that comply with the requirements above. Terms can be terminated by users or us. Users may terminate this Agreement (and their account) at any time by emailing us at support@rideally.com. Please note that Company may terminate this Agreement and your account at any time and for any reason, this includes but is not limited to the forth mentioned reasons a) If you have breached any provisions of the terms (or have acted in manner which clearly shows that you do not intend to, or are unable to comply with the provisions of the terms), b) If Company is required to do so by law. We maintain sole discretion to bar your use of service in the future, for any or no reason. Even after your participation on Platform is terminated, this agreement will remain in effect. We reserve the right to terminate the contract by sending an email to the user. THE PLATFORM IS PROVIDED BY COMPANY ON AN "AS IS" AND "AS AVAILABLE" BASIS. TO THE FULLEST EXTENT PERMISSIBLE PURSUANT TO APPLICABLE LAW, COMPANY EXPRESSLY DISCLAIMS ALL WARRANTIES, EXPRESS OR IMPLIED, INCLUDING THE IMPLIED WARRANTIES OF MERCHANTABILITY, FITNESS FOR A PARTICULAR PURPOSE, AND NON-INFRINGEMENT. COMPANY EXPRESSLY DISCLAIMS ANY WARRANTY THAT THE platform, THE SERVICES, OR THE INFORMATION, CONTENT, MARKS, OR MATERIALS INCLUDED ON THE PLATFORM WILL BE FREE FROM ERRORS, DELAYS OR INTERRUPTIONS, THAT ALL ERRORS WILL BE CORRECTED, OR THE PLATFORM WILL MEET YOUR REQUIREMENTS. YOU ACKNOWLEDGE AND AGREE THAT (I) WE HAVE NO CONTROL OVER THE AVAILABILITY OF THE PLATFORM ON A CONTINUOUS OR UNINTERRUPTED BASIS; (II) WE ARE NOT RESPONSIBLE FOR THE FUNCTIONALITY OF ANY THIRD-PARTY PLATFORM, INTERFACE, OR LINK; (III) THE TERMS AND CONDITIONS SET FORTH HEREIN ARE SUBJECT TO THE LIMITATIONS OF OUR HARDWARE, SOFTWARE AND BANDWIDTH; (IV) WHERE COMPANY SUPPLIES THE CLIENT WITH ANY GOODS OR SERVICES SUPPLIED BY A PROVIDOR OR ANY OTHER THIRD PARTY, COMPANY DOES NOT GIVE ANY WARRANTY, GUARANTEE, REPRESENTATION OR OTHER TERMS AS TO THE QUALITY, FITNESS FOR PURPOSE OR OTHERWISE OF THE GOODS OR SERVICES, AND THE CLIENT SHALL BE REQUIRED TO SEEK COMPENSATION FOR ANY LOSS OR DAMAGE SUFFERED DIRECTLY FROM SUCH PROVIDER OR THIRD PARTY. WE DO NOT PROVIDE ANY WARRANTIES, GUARANTIES, REPRESENTATIONS AND/OR RECOMMENDATIONS PERTAINING TO ANY OF THE INFORMATION AND/OR SUGGESTIONS MADE IN THE COURSE OF PROVIDING SERVICES, AND THE CLIENT IS DEEMED TO BE RESPONSIBLE FOR, AND SHALL USE ITS OWN SKILL AND JUDGMENT AS TO THE QUALITY, VALUE AND SUITABILITY OF ANY SUCH INFORMATION AND SUGGESTIONS IN DECIDING WHETHER TO ENTER INTO ANY AGREEMENT WITH ANY PROVIDER OR THIRD PARTY TO SUPPLY GOODS OR SERVICES. (V) WE ARE NOT RESPONSIBLE FOR THE PRODUCTS OR PRODUCT QUALITY POSTED BY THIRD PARTIES ON THE PLATFORM OR ANY RISK IN CONSUMING OR ANY INJURIES (PHYSICAL, MENTAL OR EMOTIONAL) RESULTING FROM YOUR USE OF ANY SERVICES OR INFORMATION POSTED BY THIRD PARTIES ON THE PLATFORM; AND (VI) OUR FAILURE TO MAKE THE PLATFORM AVAILABLE BECAUSE OF TECHNICAL DIFFICULTIES OR FOR ANY REASON OUT OF OUR CONTROL DOES NOT AMOUNT TO A FAILURE TO MEET THE OBLIGATIONS OR RESULT IN A BREACH BY COMPANY OF THE TERMS AND CONDITIONS, AND YOU EXPRESSLY WAIVE ALL RIGHT TO DISPUTE SUCH FAILURE. WE CANNOT GUARANTEE CONTINUOUS OR SECURE ACCESS TO OUR SERVICES OR PLATFORM. WE MAY UPDATE, IMPROVE, OR OTHERWISE MODIFY THE PLATFORM (OR ANY OF ITS INDIVIDUAL FEATURES OR FUNCTIONALITIES) AT ANY TIME AS WE SEE FIT IN OUR SOLE DISCRETION. COMPANY DOES NOT WARRANT THAT THE PLATFORM, ITS SERVERS, OR EMAILS SENT FROM COMPANY ARE FREE OF VIRUSES OR OTHER HARMFUL COMPONENTS. COMPANY IS NOT RESPONSIBLE FOR DELAYS CAUSED BY ACCIDENT, WAR, ACTS OF GOD, EMBARGO, COMPUTER SYSTEM FAILURE, OR ANY OTHER CIRCUMSTANCE BEYOND ITS CONTROL WHATSOEVER. UNDER NO CIRCUMSTANCES SHALL COMPANY BE LIABLE TO YOU FOR ANY PUNITIVE, INDIRECT, INCIDENTAL, CONSEQUENTIAL, SPECIAL, OR EXEMPLARY DAMAGES OR LOSSES, COSTS OR EXPENSES, INCLUDING BUT NOT LIMITED TO, LOSS OF PROFITS, MONEY, GOODWILL, REPUTATION OR INTERRUPTION OF BUSINESS (EVEN IF COMPANY HAS BEEN ADVISED OF THE POSSIBILITY OF SUCH DAMAGES), ARISING FROM THE USE OF THE PLATFORM OR ANY SERVICES PROVIDED THEREIN. REGARDLESS OF ANY LAW TO THE CONTRARY, NO ACTION, SUIT OR PROCEEDING SHALL BE BROUGHT AGAINST COMPANY MORE THAN ONE YEAR AFTER THE DATE UPON WHICH THE CLAIM AROSE. You hereby agree to indemnify, defend and hold harmless Company and our parents, subsidiaries, successors, and affiliates, and each of their respective directors, officers, agents, representatives and employees, from any and all losses, claims, causes of action, damages, demands, costs, liabilities (including legal costs on a full indemnity basis) which may arise, directly or indirectly, from or is related to or is a result of (i) your use of the platform (including but not limited to the display of your information on the platform) or from your breach of any of the Terms and Conditions set forth herein; (ii) your breach of any representations and warranties made by you to Company or (iii) any claims asserted by a third party relating to products offered or displayed on the platform. In the event that you have a dispute with any third party or Provider to a transaction, you agree to release and indemnify Company (and our agents, affiliates, directors, officers and employees) from all claims, demands, actions, proceedings, costs, expenses and damages (including without limitation any actual, special, incidental or consequential damages) arising out of or in connection with such transaction. This platform may contain links to other websites ("Third Party Sites"). The linked sites are not under the control of Company and hence, Company is not responsible for the content of any Third Party Site, or any changes and updates to it. Company is providing these links to you only as a convenience, and the inclusion of any link does not entail endorsement by us of the Third Party Site or any association with its operators or owners. Further Company is not responsible for their contents or the privacy or other practices of such Third Party Sites. You are cautioned to read such sites terms and conditions and/or privacy policies before using such sites in order to be aware of the terms and conditions of your use of such Third Party Sites. You do not use any Mark of Company; and e.g. You do not replicate, frame or mirror the content of the platform. We reserve the right to require you to remove links to the platform in our sole discretion. E-mail communications and text messages sent from the platform or from our customer care are designed to make your platform experience more efficient. By registering to the platform, you specifically agree to accept and consent to receiving e-mail communications and text messages initiated from Us or through Us, which include, without limitation: message notification e-mails, device notifications or text messages informing you about potential availability of drivers or riders and e-mails informing you of promotions we run and emails informing you of new and existing features we provide. Standard text messaging charges applied by your cell phone carrier will apply to text messages we send. If you change your mobile phone service provider, the notification service may be deactivated for your phone number and you may need to update the same in your profile. Company reserves the right to cancel the notification service at any time. If you do not wish to receive any of our e-mail communications or text messages, please do not use the services. Except as specifically stipulated otherwise, the Terms and Conditions constitute the entire agreement with respect to the subject matter hereof. No waiver by Company of any breach or default here under shall be deemed to be a waiver of any preceding or subsequent breach or default. If any part of the Terms and Conditions is determined by a court of competent jurisdiction to be invalid or unenforceable, it will not impact any other provision of the Terms and Conditions, all of which will remain in full force and effect. Any and all disputes relating to the Terms and Conditions, your use of the platform, or any other Company service are governed by, and will be interpreted in accordance with, the laws of the State of Karnataka, India without regard to any conflict of laws provisions. Headings are for reference purposes only and do not limit the scope or extent of such section. Our failure to act with respect to a breach by you or others does not waive our right to act with respect to subsequent or similar breaches. We do not guarantee we will take action against all breaches of the Terms and Conditions. Nothing on this platform constitutes an offer on Company's part or on the part of the Providers. The matters detailed constitute an invitation to you to make an offer on the stated terms to purchase arrangements featured. Providers may accept or decline any such offer. All arrangements featured or referred to are at all times prior to specific confirmation subject to availability and no warranties, promises or representations are given as to availability. Any dispute relating in any way to your visit to the platform or to products you purchase through the platform shall be submitted to arbitration, with the arbitral panel consisting of three arbitrators, one arbitrator being chosen by each party and a third being jointly appointed by the two arbitrators so chosen. confidential arbitration in Delaware, except that, to the extent you have in any manner violated or threatened to violate Company's intellectual property rights, Company may seek all remedies available to it, whether at law or in equity, including without limitation, injunctive or other appropriate relief in Bangalore, Karnataka, India, and you consent to exclusive jurisdiction and venue in such courts. Except as explicitly stated otherwise, any legal or statutory notices to Company shall be given by certified mail, postage prepaid and return receipt requested to RideAlly Travels Pvt Ltd, 417, 27th Main, Sector-1, HSR Layout, Bangalore – 560102, Karnataka, India, Email: support@rideally.com. If there is a conflict or contradiction between the provisions of these Terms and Conditions and any other relevant terms and conditions, policies or notices, the other relevant terms and conditions, policies or notices which relate specifically to a particular section or module of the platform shall prevail in respect of your use of the relevant section or module of the platform. If you have any questions or concerns about these Terms and Conditions or if you need further assistance with respect to access to or use of the platform or the services offered by company, you may contact us as per information provided in “Contact Us” section on Platform. We will attempt to respond to your questions or concerns promptly after we receive them.